Visualization of key events from the evening of March 27, 2011, courtesy Forensic Architecture and SITU Research. Established in 2011, Forensic Architecture is a research project based at Goldsmiths, University of London. Collaborators are drawn from a variety of disciplines – architecture, art, film, activism, and the law – and they undertake research that gathers and presents spatial analysis of conflict sites and sites of humanitarian interest (see: cross-pollination). Forensic Architecture’s investigations have provided evidence for international prosecution teams, political organizations, and the United Nations. The term case is used to include specific examples to be made use of by NGOs in a political or legal context. The “Left-to-die Boat” case prepared by the Forensic Oceanography team (Charles Heller, Lorenzo Pezzani, and SITU Research) was initiated to support the NGO-led coalition seeking accountability for the deaths of sixty-three migrants left to drift on board a small boat for fourteen days in the central Mediterranean Sea, at a time in which the region was being actively monitored by the NATO-led coalition intervening in Libya. 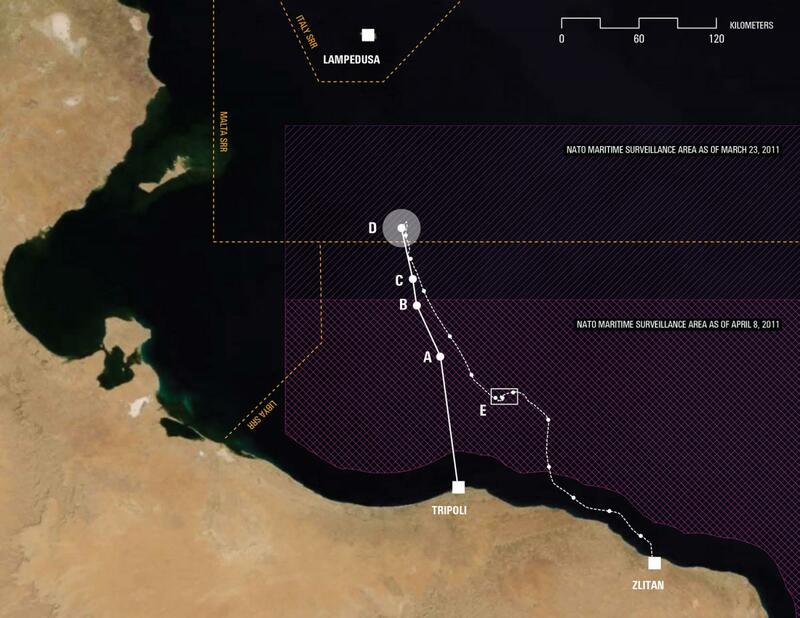 The April 11, 2012, report outlines the scale of surveillance measures deployed by NATO, building a dossier of quantifiable evidence to prove that the sophisticated maritime surveillance in use would have detected the presence of the boat during its prolonged stay. The report has been disseminated widely in the media and amongst advocacy groups, including citations by the Guardian, Human Rights Watch, and the BBC. The report presented in exhibition consists of the film work Liquid Traces: The Left-to-Die Boat Case, 2012, licensed by the Museum of Modern Art in Warsaw for the duration of the exhibition. Courtesy Charles Heller, Lorenzo Pezzani, and SITU Research. 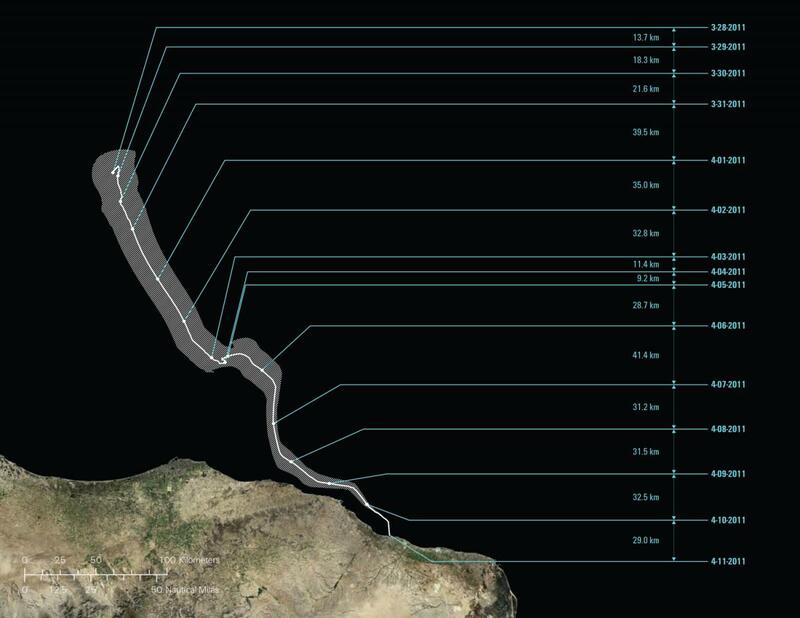 Visualization of the hourly position of the migrants’ vessel (March 28, 2011 through April 11, 2011), based on ocean current and wind data, courtesy Forensic Architecture and SITU Research.